Click on any photograph to enlarge. Use your back key to return to this menu. The Trans Global Highway would physically link by highways and by rail transport, all continents and major population centers, with the present exception of Australia, which, in the future, may be linked via very long suspended, pre-formed, suspended underwater tunnels from extending from the Philippine island chain. From a human point of view, the advantages of the Trans Global Highway are enormous. First, it would allow rapid transport of raw materials and finished goods from near and far. In addition, the Trans Global Highway would offer a conduit for gas, oil and water pipelines, as well as communication and electric power cables. It should be noted that fresh water is a major issue among arid areas, throughout the world, including the Middle East, western United States, Africa and Central Asia. The Trans Global Highway combined with water pipelines from areas of abundance to arid areas, could benefit humankind even more. Perhaps there is a solution to the theoretical threat of global flooding from melting land ice at the poles, that some people fear. The Trans Global Highway would undoubtedly increase global security through mutually dependent trade and commerce. As with almost all major public works projects, such as the Suez Canal, the Panama Canal, the Chunnel, the Alaska Pipeline and others, many people will argue that the tunnels, bridges and roads are not necessary. Some may present counter arguments stating that existing air and sea transport is just fine. Further, the cost may at first, may seem astronomical, but in retrospect, every one of these visionary projects has greatly helped mankind in commerce and progress. Ultimately, the Trans Global Highway will be constructed, in one form or the other, but we have an opportunity to start with, at least the ground work of planning, today. The primary obstacles, are not technical, and not even financial, even though the costs may seem high. The real obstacle to the construction of the Trans-Global Highway is political. Many bordering countries are presently at odds with one another, and may not be willing to allow a free moving highway to run through their territories, even with the potential of vast economic benefits. From a technical point of view, the entire road and rail network is feasible, utilizing the engineering, materials and technology of today. At first glance, the development obstacles of the AmerAsian Peach Tunnel (Bering Strait tunnel) may seem insurmountable, but this is not the case. The Bering Strait Tunnel would consist of 3 tunnels connecting Alaska and Russia by going through two islands (the Little Diomede(USA) and Big Diomede (Russia)). The longest single tunnel would be 24 miles in length. Since the Bering Sea at the proposed crossing has a maximum known depth of only 170 feet, it is proposed that the tunnel be dug using conventional, modern tunnel boring machines, of the type that was employed in the construction of the Chunnel. The three tunnel proposal would be much preferred over a bridge for a variety of reasons including that fact that during the winter months, the Bering Strait is iced over and a bridge would be subject to sever environmental conditions. Further, in most cases, tunnels are both less expensive to construct and cost less to maintain. Suspended under water tunnels are not suggested for this crossing, because of the shallow depth of the Bering Strait. It is proposed that the AmerAsian Peace Tunnel start on the US side, from the town of Cape Prince of Wales, which has a population of 156 and about 80 buildings, including a large school, streets and general store, and end at the Russian settlement of Naukan or 2 km north at the Dezhnev settlement. It is further proposed that the tunnel pass though both Little and Big Diomede islands which can be used for ventilation shafts and possibly as a relief station. Both Little Diomede (USA) and Big Diomede (Russia) have been occupied for hundreds of years. 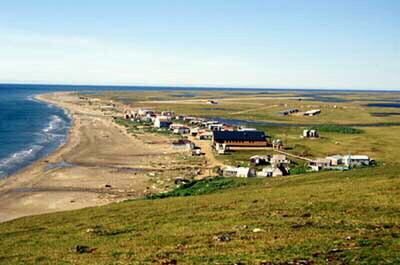 Little Diomede has a Inalik native village with a population of about 200 and has a high school, store, Post Office, a community hall and many residences. The terrain of Cape Prince of Wales is very similar to the rolling grassy hills of Scotland and the gentle hill ends at a flat area at the Bering Strait with a very nice beach. The terrain of the Diomedes as well as the Russian Asiatic mainland is similar to the fiords of Norway, though the tops of the hills again are very similar to the rolling grassy hills of Scotland. Archeological findings, date back to over two thousand years. There are relatively flat areas along the coast of Russia, around the proposed exit of the tunnel, that would be ideally suited for a major highway and rail transport. In the winter time, the surface of the Bering Strait is frozen and it is possible to walk or even drive across the Strait, however, this is very dangerous, not to mention that crossing would be going across international borders. The tunnel would not be affected by the frozen Strait and tunnels under similar conditions have been constructed world wide. Cape Prince Wales (USA), looking towards Russia, in the summertime. Asiatic Russia, just past the Diomede, in summer. The green is enhanced. In reality, the greenery is similar to Cape Prince of Wales, Alaska. Little Diomede (USA) in the foreground. It should be noted that presently, there are many tunnels around the world that are as long as the longest tunnel needed to complete the Trans-Global Highway. The "Chunnel" linking England with Europe is approximately 31.34 miles (50.45km) long, the ocean tunnel Seikan linking Hokkaido with Honshu in Japan is 33.46 miles (55.86km) long, while the new Swiss Gotthard tunnel through the Alps, currently under construction, will be 35.7 miles (59.60km) long. There are in fact, 5 tunnels over 30 miles in length, in existence today. The Bering Strait is named after Captain Vitus Bering of the Imperial Russian Navy, who was sent by Peter the Great, in 1725, to explore the ocean surrounding the eastern most reaches of Russia. Japan could technically be connected with mainland Asia via five tunnels extending from the city of Fukuoka on Kyushu to the port city of Pusan in Korea via four islands. The maximum ocean depth in this area is 480 feet. It is also feasible to connect Japan to mainland Asia by constructing two tunnels extending north from Hokkaido to Sakhalin Island, which would be 25 miles (42km) long and a second tunnel from Sakhalin to the Siberian Russian mainland, which would only be 4.2 miles (7km) long. Recent estimates are that as much as 20 million tons of goods, manufactured in Japan could be shipped overland via the Russian railroad system, bypassing the current costly shipping costs, that include transit through the Suez Canal. There is a major financial incentive to build the Hokkaido Sakhalin-Siberian tunnel. It should be noted that the Russian standard gauge railroad tracks have a slightly higher gauge than the global standard. Thus the rails on the Russian guage tracks are approximately 8" (20cm) farther apart than the rest of the standard gauge rails. This system was adapted to have a wider footprint, to minimize sinking in the soft summer soil in the tundra region (though some historians have also stated that this "non-standard" was adapted to prevent foreign armies from quickly using Russian tracks in the event of war. Prior to the 1905 Russo-Japan war, the Chinese railroads, which Russia built, also used this wider gauge After 1905, when the Japanese took over the Chinese rails, the Japanese rebuilt the rails to conform with the global standard, which Japan had adapted. Today, railroads employ various techniques to overcome this inconsistency including the addition of undercarriage hubs. One example of how conflicting gauges are dealt with is shown below in the photographs shot by the author in 1971. Perhaps a better, automated solution would be to use flat cars designed to use the global standard 40 foot (12 meters) and 20 foot (6 meter) shipping containers. These containers could be loaded from one gauge flat car to another gauge flat car in a matter of seconds. The author was amazed by the speed in which container ships were loaded and unloaded. Similar special technology can be engineered to do the same with railroads. The Sakhalin Island has an advanced and extensive rail system. Further, the Sakhalin Island region is very wealthy, being one of the major oil producing regions of the world. can be made to run on European gauge track. while traveling in Wiebligen, western Germany, interested in model electric trains. Click to enlarge. Use your back key to return to this menu. Much of the arctic region has limited snowfall and can be controlled and handled through conventional rail and road snow removal techniques. In certain areas of high snow fall and accumulation, it may be possible to construct steep roofed, prefabricated, inexpensive snow roofs along the length of the effected track or road. 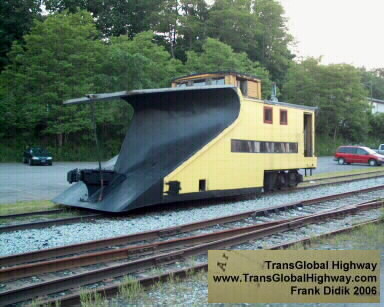 This is an old fashioned train snow plow found in Honesdale Pennsylvania. Unlike this 100 year old train, modern railroad snow removal trains employ snow blowers that run at relatively high speeds. 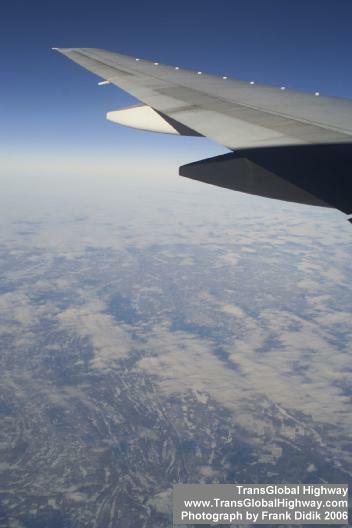 Canada, where photographed by the author, while flying in a commercial Airline from New York City to Japan, in February, 2003. 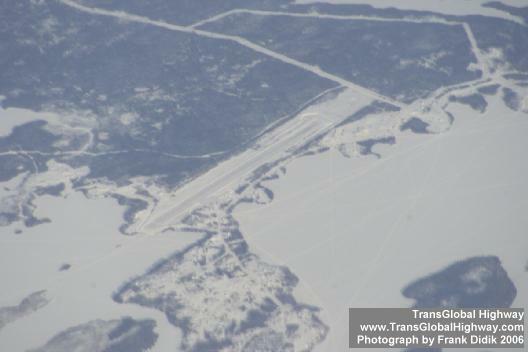 This seemingly harsh terrain in fact is crisscrossed by roads and even small airports. 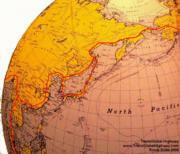 The terrain in Alaska and Russia, around the Bering Strait is slightly less rugged. Existing paved roads exist in both Russia and Alaska within a few miles of the Strait. These roads can be widened to form part of the Trans Global Highway. In the summertime, much of this area is spectacularly green with tall grass. It may be possible to encapsulate the expanded and enlarged roads and rail links with a network of in-expensive overhead prefabricated protectors. A possible solution for Global Warming Issues and concerns. Recently, there has been concern in the media that the earth is getting warmer and this has been referred this as "global warming". Some people have gone so far as to state that the Arctic and Antarctic ice caps are melting and that the coastal areas will be under water in the near future. Weather or not these dire predictions are correct, the fact is that the Trans-Global Highway could act as a pathway not only for rail roads and vehicular traffic, but also for oil, gas and water pipe lines. Fresh water could be piped from the fresh water rich northern regions to the arid parts of the world. Overnight, issues regarding water usage could be solved. Presently, there are a number of areas in need of additional fresh water including the western states of the United States, the Middle East, central Africa and Central Asia. The Trans Global Highway, with fresh water pipelines running beside it, would be able to relieve the need for rationing water. In regard to "Global Warming", it should be noted that historically, earth does seem to go through long warm-cool cycles. For example, 1100 years ago, southern Greenland still had trees, but these died out as Greenland became progressively colder between 900 and 1100AD. Today, it seems that we are indeed entering into a warmer period. It should also be noted that ice melting on water does not increase the height of the water, since it has already displaced this water. If ice is on the land and melts, it is possible that resulting water could theoretically flow into the oceans and perhaps raise the sea level by a modest amount. 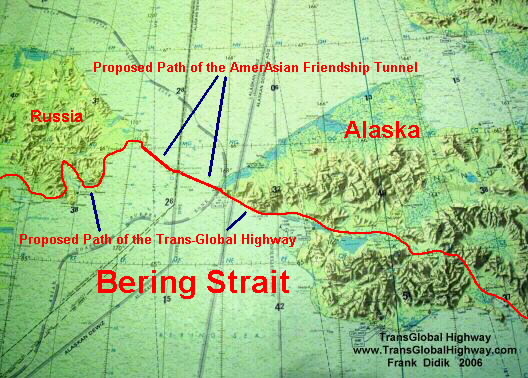 The proposed AmerAsian Tunnel would link North America and Asia, across the Bering Strait, for the first time in an estimated 9 thousand years. It would create a highway, railroad, fresh water, oil and gas pipelines and communication crossings. From and engineering perspective, the construction of the AmerAsian Tunnel is straight forward without any particularly complex issues involved. The Tunnel would comprise of 3 tunnels connecting Alaska and Russia going through the Little and Big Diomede Islands. Little and Big Diomede Islands showing path of proposed Bering Strait tunnels. The Bering Strait is very shallow with a maximum depth at the proposed tunnel crossing of only 170 feet (52meters). The surface of the Bering Strait is frozen some of the time. The tunnel could be constructed in segments in factories and then sunk and assembled underwater. It could also be construced using modern tunnel boring machines or TBM's. The TransGlobal Highway would incorporate the existing railroads and highway networks in each country. The illustrated path of the proposed TransGlobal Highway would also have numerous other tributary roads. Existing roads may have to be strengthened and or widened and brought up to a single standard. The railroads of Russia are of a slightly wider gauge This was designed to provide a greater footprint so that the rails would not sink in the soft soil. 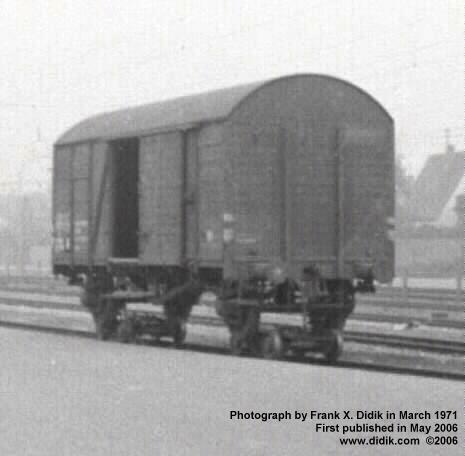 Technologies exist for dual gauge train cars. (Kindly see photographs of dual gauge trains, below). 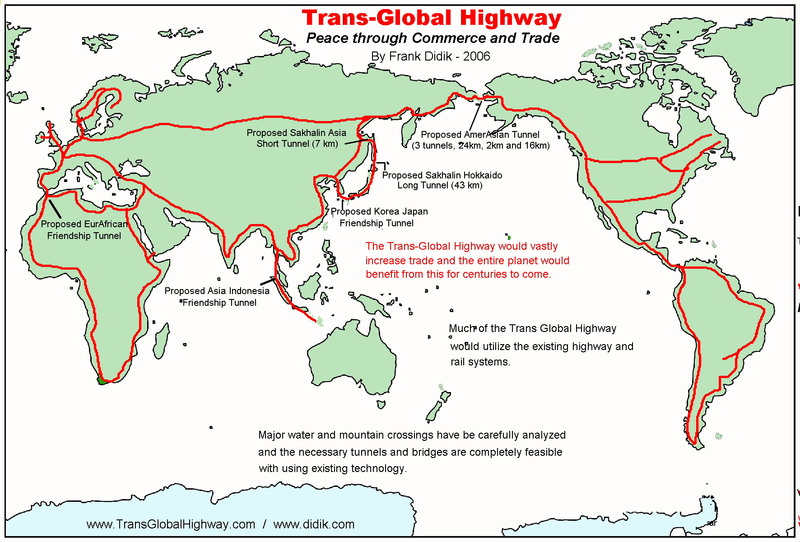 The world as a whole, would greatly greatly benefit from the TransGlobal Highway. For example, Japan, in 2002, shipped 12 million metric tons of finished goods to Europe, primarily by ocean. Some of the goods went through the Suez Canal, while a portion of the goods also went around South Africa. The shipping time from Yokohama to the European port of Antwerp was in the order of 45 days. By rail, via the Trans Global Highway, this time could be reduced to 12 days. It is proposed that two major tunnels be constructed to link Japan with Asia. 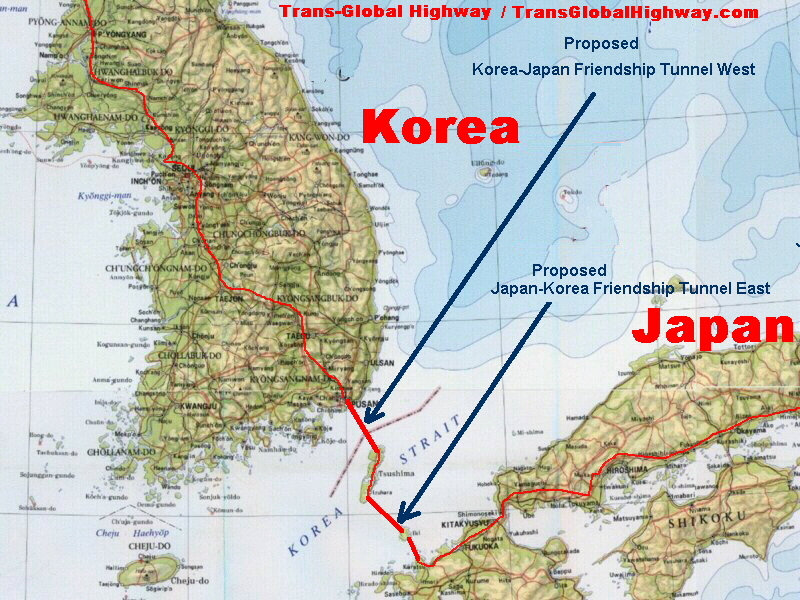 These being the Korea-Japan Friendship Tunnel and the Hokkaido to Sakhalin Island-Asia Tunnel. 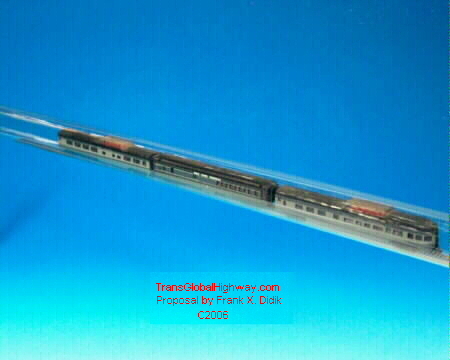 These tunnels would thus quickly connect Japan and the rest of the world to quickly and effectively transport people and goods, at a minimal cost. None of the major tunnels that would have to be constructed for the TransGlobal Highway would be particularly difficult to build. 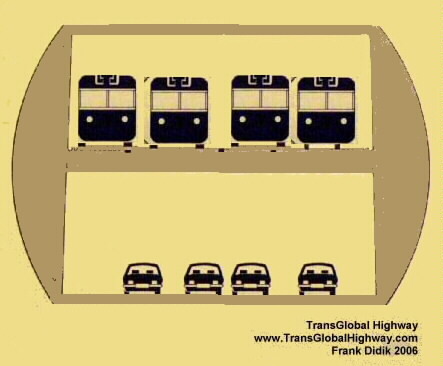 All of the tunnels would be going through relatively shallow water. The tunnels can be constructed in segments and than sunk and anchored to the bottom. In some cases, could in fact be suspended from the ocean floor, deep enough not to be effected by adverse surface weather conditions. This system is not envisioned nor needed for the proposed tunnels, however this system could be employed if at such time, a tunnel was to be constructed to link Australia to the rest of the world, between the Cape of York Peninsula in Australia and Papua New Guinea or Darwin to Timor, via Melville Island. (See below for more details). The proposed segmented, prefabricated tunnels could provide for both vehicle as well as rail transport, though with the potential complexity of ventilation, a Chunnel approach may have to be taken, whereby the vehicles are transported by electric powered railroad, through the tunnel. Equally important, the Trans Global Highway would offer a pathway for oil and gas pipelines, communication cables as well as water pipelines to transport fresh water from areas of abundance to arid areas. In a way, much of the TransGlobal Highway already exists in local roads and highways across the globe. The proposed TransGlobal highway would utilize the existing transportation network, extending, widening and perhaps strengthening it so that it forms a uniform global highway. 5. Fresh water pipelines could minimize the concern of flooding as presented in the theory of global warming. 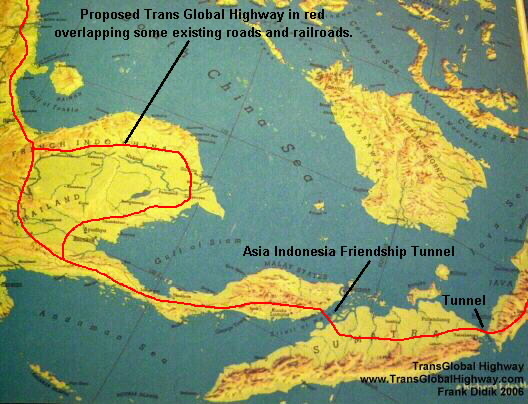 A series of long, though not particularly difficult to construct tunnels is proposed to be built linking Indonesia and Australia with the rest of Asia, Europe and the world. This would be a huge advantage for global trade and travel. It should be noted that in every case when a major bridge or tunnel has been proposed, there are groups of people who have argued that existing ferries and boats or out of the way roads were good enough. The fact is that after such construction, everyone immediately agreed that the bridge or tunnel was needed. Such examples can be seen with the Chunnel, the Brooklyn Bridge, the Varazono Narrows bridge and many other examples. If a tunnel was to be constructed to link Australia to the rest of the world, between the Cape of York Peninsula in Australia and Papua New Guinea (147km / 88.2 miles) or Darwin to Timor, via Melville Island (400km / 240miles). These incredibly long tunnels are not being proposed at the present time, though it should be noted that the Swiss Gotthard tunnel through the Alps, which is at the final stages of completion, will be 35.7 miles / 59.60km long. Arguable, the Swiss tunnel, bored through solid rock, is more difficult to construct than the potential Australia-Papua New Guinea tunnel. Presently, a major seaport is proposed to be constructed on Timor so to link Timor with Darwin and the rest or Australia. 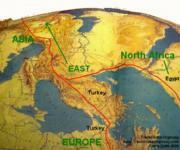 Turkey, which is situated both in Asia and Europe, is presently linked to Europe via two bridges. A third bridge is Presently at the beginning phases of construction. The concept of linking Spain with Africa, in the area of Gibraltar has been dreamed of and proposed, many times over the past thousand years. The proposed EurAfrica Tunnel is an absolute must and is technically very easy to accomplish. It would allow a vast amount of raw materials and finished products to be sent back and forth between Europe, Africa and the middle East. This illustration is based on the 1929 proposal to link Spain with Africa, just south of Gibraltar. With some slight modifications, and a much wider (though not longer) tunnel, Europe and Africa can finally benefit quickly and easily from one another. Closeup of the proposed path of the AmerAsian Friendship Tunnel. 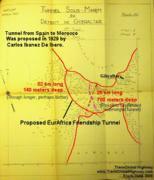 The AmerAsian Friendship Tunnel would consist of 3 tunnels, with the longest being 23 km. The tunnel could be built in 10 years at an estimated cost of 5.5 Billion (thousand million) U.S. Dollars. 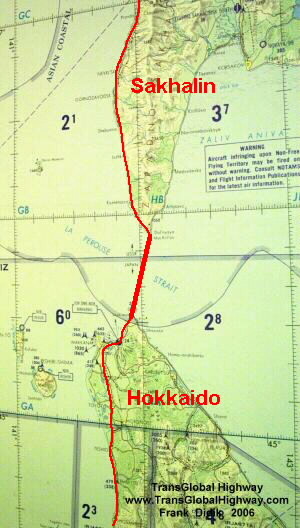 Closeup of the proposed path of the Sakhalin-Hokkaido Long Tunnel. Closeup of the Sakhalin-Asia Short tunnel that would connect the Sakhalin Island with Siberia. The proposed Sakhalin-Asia Short tunnel would be 7km (4.2 miles) long. It could be constructed in 4 years at an estimated cost of 350 million U.S. Dollars. Proposed path of the Sakhalin-Hokkaido Long Tunnel and the existing Seikan ocean tunnel . Plate tectonics, should not play any significant role in the design. Nevertheless, in certain cases, such as the AmerAsian Peace Tunnel across the Bering Strait, a careful engineering study should be made to determine, what, if any effect, would the theory of plate tectonics have upon the proposed tunnels. Today we have many engineering marvels which defy the powers of nature including massive dams, flood water levies and incredible structures, such as Taipei 101, which is presently the worlds tallest building and is built in a major earthquake zone. The slight but predictable changes in plate orientation can be taken taken into consider during the design phase. TRANS-GLOBAL HIGHWAY REPORT ON CD-ROM: A complete, highly detailed report, is available on cd-rom that covers the entire proposed route and proposed solutions to all issues regarding the technical issues regarding the Trans-Global Highway. If you represent a government agency, think tank, academic institution, bank, environmental group or major corporation, kindly send an email explaining your interest in this project. TRANS-GLOBAL HIGHWAY documentary designed for television, is being produced and will be available shortly. 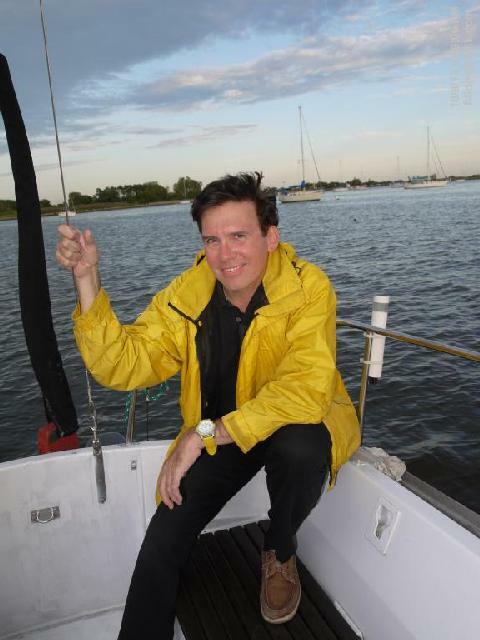 To control spam, please write "Trans Global Highway"
"The Futurist", anchored in New York Harbor. Since 2006, when my Trans Global Highway proposal created shock waves, there have been several changes in technology, the political environment as well as new global concerns, particularly in the area of the environment. Rather than updating my original proposal to the left, which has become a sort of internet standard, this column will attempt to address some of the changes that have occurred over the past 10 years. The Trans Global Highway is even more important today, than it was when I first considered the Trans Global Highway in the late 1970's or when I wrote the internet proposal in 2006. The construction of the Trans Global Highway would greatly increase the overall global standard of living and would alleviate certain fears regarding over population and limited resources. The Trans Global Highway will be able to quickly distribute the resources from one part of the world, to another. Over the past 10 years, I have traveled around the world to many places and have repeatedly flown over vast tracks of uninhabited areas of Asia and North America. It is clear that the Trans Global Highway will allow huge areas of resources to become accessible and this will have the effect of vastly improving the lives of so many people and as a consequence, will open up vast new areas of business that will result in overall global progress. 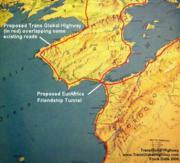 The fact is that the Trans Global Highway will revolutionize the world. Whole new industries would develop as a result of the Trans Global Highway. Products that in the past were too expensive to transport great distances, could suddenly have new markets opening up. Heavy farm equipment could be transported from one area to another, depending on the planting season. Water and natural resources, that in the past were too far or isolated from urban areas, can suddenly be transported around the world. Electrical power plants could be situated in remote areas of the world, far away from large urban cities and the concerns that some people may have about them. the advantages to human kind is endless and will benefit the world for centuries to come. Why Build the Trans Global Highway? One excellent solution to future population concerns as well as alleviating many of the effects of potential global warming is the proposal for the construction of the Trans Global Highway. The proposed Trans Global Highway would create a world wide network of standardized roads, railroads, water pipe lines, oil and gas pipelines, electrical and communication cables. The result of this remarkable, far sighted project will be global unity through far better distribution of resources, including heretofore difficult to obtain or unaccessible raw materials, fresh water, finished products and lower global transportation costs. All aspects of the technology needed to build the Trans Global Highway is fully understood and has already been developed and thus the can be built right now, with the technology of today. Further, the Trans Global Highway for sure is economically viable and in fact, would recolonize business and all social aspects of society. The major reason slowing down the project is not technical, but rather political. I believe that conducting a series of international conferences and coming to basic agreements over a three to five year period can yield an international agreement and the Trans Global Highway could become a reality within ten years from today. It is my belief that most cross water connections, particularly cross ocean connections in remote areas, should be tunnels rather than bridges, since being underground would protect such crossings from the elements. Further, as mentioned in the past, roads in areas of heavy snow, or environment may be built raised off of the ground or covered. Again, this solution would be for transits in particularly difficult and remote terrains. The fact that certain segments of the Trans Global Highway would be above the ground will also allow wildlife to pass under the pathway. It is interesting to note the major tunnels and bridges in existence. Most of these tunnels are in fact longer than the longest proposed tunnel needed to complete the Trans Global Highway. The distance of my proposed AmerAsian Friendship Tunnel is equal to going back and forth to New Jersey, by the Lincoln Tunnel 12 times. This is actually considerably shorter than the Key West Bridge. Cost to build The cost to build the Trans Global Highway is minuscule when compared to the enormous advantages that would emanate from its existence. Roads cost, through hostile environment, about 1.5 Billion per 1000KM. For example, the Qinghai (China) to Tibet railroad, which is 1954km long, cost 3.2 Billion Dollars to build. 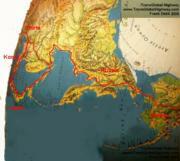 The estimated cost to build the AmerAsian Friendship tunnel, between Alaska and Russia, will cost 21 Billion Dollars. The estimated cost to build the Sakhalin to Hokkaido Long Tunnel to be 45 Billion Dollars. The yearly snow clearing and maintenance is estimated to cost 2.1 Billion Dollars. This maintenance cost should be universally paid by all countries, based on their economic size, potential utilization of the Trans-Global Highway (even if they do not border on the main road). Thus countries pay jointly for all of the roads since all countries will benefit from the existence of the Trans-Global Highway. Payment should be similar to the payment contribution made by each country to the United Nations. Population control. I realize that this a particularly touchy area and there are overlapping reasons given for some of the population control programs. In general, the reasons given for population control is fear of a limited amount of resources and available energy and food supplies. Rather than discouraging or restricting the formation of families in order to stabilize or reduce population another approach would be to let the population expand, without controls, and at the same time, vastly expand available resources. Clearly the Trans Global Highway would assist in greatly increased food production, clean water supplies and rapid distribution of resources world wide. There are vast areas of our planet that have an abundance of resources of every variety, and yet these areas seem to isolated to make proper use of. Construction of the Trans Global Highway will change all of this since we will be able to get fresh water from areas with huge reserves of fresh water, such as northern Canada and Russia and pipe this water to areas with limited water supplies such as central Russia, North Africa, and even to the western part of the United States, that is presently rationing water to farms. Thus the Trans Global Highway would increase available food supplies worldwide. Further, transportation costs would be reduced and the speed to transport heavy items would be increased, when compared to ocean ship transport, thus low value cement or time dependent heavy machinery could be quickly transported from one area of the world to another. Such things as expensive mechanized farm equipment could be utilized for one month in one area of the world and then shipped to another area, with a different growing season. A large number of new industries would be formed with massive economic opportunities. Further, the entire planet would benefit with increase food supplies, inexpensive electricity, and fuel and mineral resources could be transported from isolated areas to urban areas. If we continue with the current direction of global population control, we will end up with a stagnated medieval type of world, with very little progress, and massively declining standards of living for all, rich and poor. To restrict or reduce population, based on resources available today and a very limited understanding of the future availability of resources, will lead to nothingness. Already the resulting decline in birthrates and aging populations has created many new and unforeseen consequences. This includes a declining tax base, a greater tax burden for the younger people, a greater percentage of people required to take care of the elderly, declining industrial output and a significant decline in the standard of living for many young people. Many people today still quote Thomas Robert Malthus's from the 18th century and several others more recently, who predicted that society would run out of resources and thus cause massive human starvation and strife. The fact is that Thomas Robert Malthus's famous dire food shortage predictions of 1798 and his subsequent books, over the next 30 years, failed to take into consideration modern advances in farming, transportation, food storage and food abundance. There really is a better way for society, than to push population control. The solution is simple. Have an international effort to build my proposed Trans Global Highway. The Name is Confusing: It was probably an error on my part many years ago, to name the project "Trans-Global Highway" since most people associate the word "highway" with a roadway, when in fact, I always viewed the Trans-Global Highway as a pathway or a conduit for a variety of long distance transporting needs including electric cables to send electricity generated from distant places to urban areas, communication cables, oil and gas pipelines as well as being a pathway for high speed programmed trains and finally a roadway for truck and car transportation. For extremely long range journeys, I have always felt that the best way to transport goods would be using programmed trains, rather than trucks, however for shorter trips, such as between local cities or in relatively populated areas, trucks and car would no doubt utilize the Trans-Global Highway. Regarding Hyper Loop: Recently, as a result of a series of news reports, it is natural for people to wonder if the "Hyper Loop" might somehow be incorporated into the Trans Global Highway. My answer is that based on what I understand about the proposed Hyper Loop, the Hyper Loop would not be effective for the Trans-Global Highway project. I believe that the Hyper Loop system would be too expensive to operate and would never be able to transport the volume of material and passengers that would make the Trans Global Highway a financial and practical success. The Hyper Loop supersonic transport system, in a closed tube may well take years to develop and will probably never be able to supply the volume of freight and passengers, at a reasonable cost, as envisioned will occur with the Trans Global Highway. 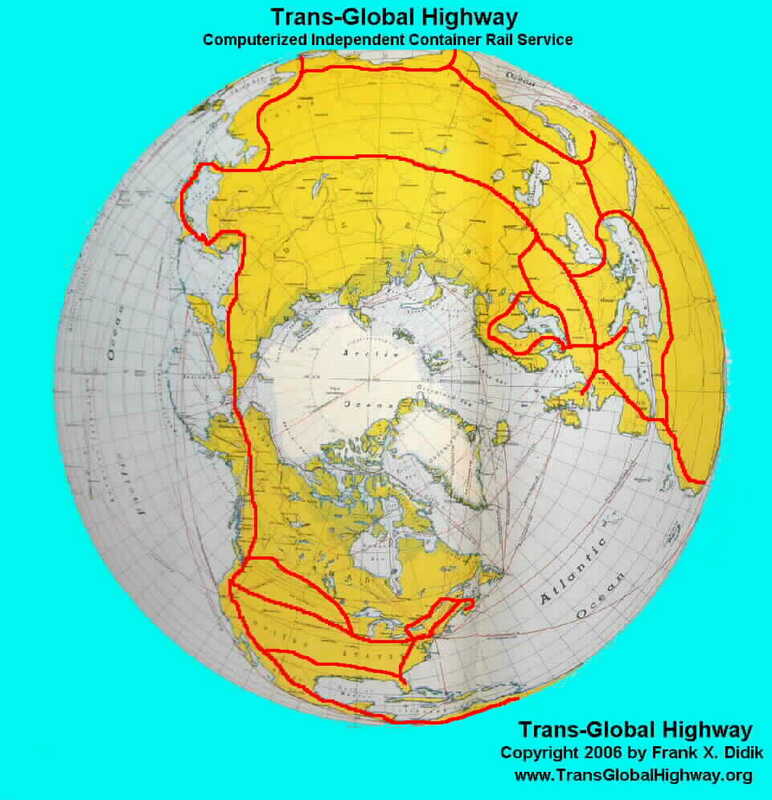 Trans-Global Highway as proposed by Frank Didik. Other important elements include freeway, expressway, byway, by way, motorway, routes, autoroute, autoput, autopista, boat, "byway open to all traffic", way marked, autoweg, auto-strada, autostrada, motor vag, motorvag, carretera, autobahn, kousokudouko.Trans Global Highway. Trans World Highway.